Maison les Calanches is a traditional granite built house set within the picturesque village of Speloncato. Spectacularly situated overlooking the Regino valley, Maison les Calanches affords outstanding views across the valley to the sea. The house has been recently refurbished to a high standard. The well equipped kitchen provides a fridge, washing machine, dishwasher and microwave, plenty of cupboard space and a wine rack. The spacious lounge/dining room is comfortably furnished with sofa, easy chairs and a traditional chestnut dining table. On the first floor there is a double bedroom with ensuite, the twin bedroom has adjoining shower room with toilet. The deep granite walls afford a cool repose from the hot afternoon sun, the wood burning stove provides comfort during the cooler evenings of early spring and autumn. To the side of the house is a terraced garden where one can eat al fresco, enjoy a glass of wine and watch the spectacular sunsets in the quiet of the evening. Winter lets: The property is available all the year round. The winter months may be of interest to intrepid walkers or those who just want to escape the rat race for a while. Some restaurants and bars close during the winter months but there are still many places open for the local people particularly in I'lle Rousse and Calvi. The weather is changeable. You could experience high winds, thunderous lightning storms and If you're lucky you may get snow. Exciting in the mountains. The wood burning stove in the property creates a warm and cosy atmosphere and wood can be collected locally or purchased in I'lle Rousse. The beauty of Corsica is that the island is not so much a tourist attraction as a visitors discovery. toilet, combination tub/shower, tub, There is also a wash basin. toilet, shower, There is also a washbasin. Wood burning stove and portable radiators. Within short walking distance of the house. For filter coffee. There is also a plunger coffee jug. Plenty of crockery, cutlery, bottle openers and stoppers, bag clips. Dishwasher, washing machine, microwave, toaster, fridge, coffee makers. There is a fine dining table in the lounge which will accommodate up to 6 guests. One can also dine on the balcony or on the top terrace in the garden. Terraces with views across the valley to the sea. The terraces are steep. Young children need careful supervision if playing in the garden. See photos for verification. Balcony with table and chairs for dining. Table and chairs. Ideal for outdoor dining. Sun shade umbrella. The property was clean and well equipped in a picturesque friendly village. The views were amazing. We really enjoyed our time here. We spent almost all our evenings on the balcony watching sunsets, stars etc and listening to the Scops owls. The village shop has most things you need and the owner is lovely. Corsica is fabulous. It was our first time but we will definitely return. It was great to be slightly cooler at night than at the coast and to have access to the valley over the ridge behind Speloncato. If there is a downside it is the winding roads which mean every outing takes a while but it also means most places are quiet and unspoilt. The house had everything you need including beach towels, beach parasol etc and bedding and towels were good quality. I think some loungers would be a good addition so you can make full use of the garden. WiFi would also be a bonus for planning trips etc. A traditional house with a fantastic view. The accommodation is excellent for those seeking a quiet retreat in a hill side village. 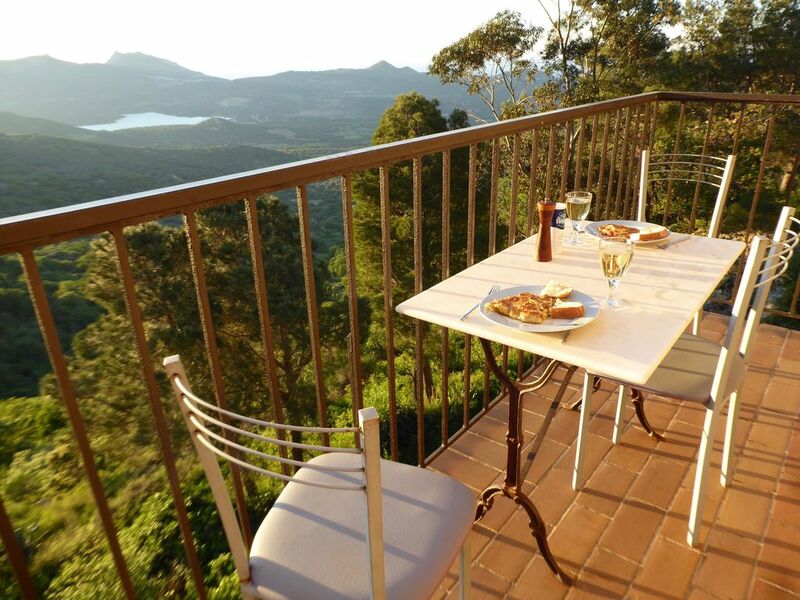 The view from the balcony stretches to the sea and is an excellent position for observing the numerous birds of prey. It is a perfect place for those who enjoy a rural setting and wish to go walking. Bringing binoculars is recommended. Likewise it is not too far from the local beaches and resorts and offers a quiet haven after a day at the coast. The accommodation is simply furnished but has all the attributes expected for modern living and represents excellent value particularly if fully occupied. There is ample parking nearby but access is by foot along a short cobbled path with steps which would not suit those with restricted mobility. We had a great time using the house as a base for exploring Corsica locally and further afield and will never forget the evenings sat on the balcony watching the sun setting whilst red kites floated on the breeze. We had a beautiful week here in October. The house is very comfortable and well equipped with amazing views of the mountains right down to the sea. We felt privileged to be perched up here in Speloncato on top of the world! Quickly got used to the winding roads which actually are very well engineered. Most memorable were the peacefulness and quietness, the clear bright light and waking to that view. Highly recommended! So glad you had a good holiday Jude. Yes the views are pretty spectacular. Even in the Winter months there is always something new to experience. Speloncato is a magical place. Hopefully see you back again sometime. A lovely house with fantastic views of the mountains and the sea. It is close to great beaches for swimming and snorkelling. There are lovely walks from Speloncato to neighbouring villages passing through oak and olive groves. There are plenty of trails in the hills around the village which are well marked. Speloncato has a well stocked Epicerie. Best of all we enjoyed just sitting on the balcony taking in the beautiful view and watching the sun set each evening. The owners were very helpful. We would definitely recommend Maison Les Calanches if you want to get away from the stresses of modern day life. We loved our stay in Pip and Bob's house - everything we needed and the most extraordinary views from every window. Maison les Calanches is a delightful base from which to explore la Balange area of Northern Corsica. What a view from the balcony as you open the shutters on your arrival. Though you've had a pretty good hunch it's going to be great as you drive up from the coast road seeing ever more amazing vistas. Soak up the sun, not to mention a Pietra bier on that balcony. Watching the sunset is magical, at any time you can sit for hours and still see something new. The bird life is great. When we visited late August; eagles, kites and ravens whirred above us. Whilst swallows and swifts put on an aerobatic display regularly. Chats and warblers busied themselves in the olive and myrtle trees below. Tiled floors throughout the house keep you cool though, but remember to shut the shutters when you go out in the morning, so it's nice and cool for your siesta. Speloncato is a very friendly town, the cafe has a lovely relaxed buzz. But the town remains un-spoilt, despite all its beauty. Had great beach mornings at Lozari and then Bodri. The latter had a great Italian flavour; all there appeared very stylishly and tanned, compared to this very pale Englishman. Very welcoming vibe though and not over crowded. We drove up above the town of Speloncato over the pass to Foret de Tartagine. As you pass over the Col at Bocca di a Battaglia you're driving at a height a few metres above that of the summit of Snowdon! What a drive, challenging but beautiful. The Auberge at the Foret de Tartagine is great for a coffee before exploring the valley, we went downstream and found a lovely spot amongst the rocks to bathe in the river. In mid August only saw 2 or 3 other people all morning. All in all Maison les Clanaches was a great holiday home to start our Corsican odyssey. From there we moved onto the south for our second week in Sartene. Lovely there too, I see why Corsica is known as the Island of Beauty. As with all villages in the Balagne the village square in Speloncato is the hub of village life. The welcoming shop is well stocked with fruit, veg, local cheeses, olive oil, hams and basic commodities. Bread can be ordered from here on a daily basis and meat and fish vans visit the square regularly. There are two bars/restaurants. 15kms down the mountain roads to the coast are the beaches of Lozari and Ostraconi, great for swimming and wind surfing. Visit the bustling towns of I'lle Rousse and Calvi where you can enjoy the beaches, the many bars and restaurants, and stroll through the streets for some excellent shopping. Leisure activities include sailing, diving, wind surfing, water skiing. There are boat trips to the coastal nature reserve of Scandola and visitors are welcomed to join in the local festivals and celebrations. Walks, either challenging, relaxing or both can be accessed from the village and beyond and the views are spectacular. For bird lovers the Red Kites and Ravens fly passed the balcony each day lazily sweeping through the valley, Other birds seen from the balcony are Rock Thrush feeding young, Jays, Spotted Woodpecker, Marmora's and Ophean Warbler, Gosshawks, Peregrins, Lesser Kestral, Buzzards of course but, as yet, no Corsican Nuthatch. Ever hopeful but I think you only see them high up in the pine forests. Swifts, Martins and Swallows provide a spectacular display of aerobatics while feeding on the wing in the early evenings. The other bird to see not far from us in the Asco Valley is the Lammergeier. At the Lake we have seen the Osprey, Squacco and Purple Heron and the lovely Hoopoes. Please note, You will be asked to pay a refundable security deposit of £200.00. Change over day is Saturday. However, please get in touch with me if you would like to discuss the possibility of arriving on another day of the week. The property will be available from 3:30pm on the day of arrival and on departure guests are asked to vacate the property by 10:30am. Please be sure to leave the property in as good a condition as you found it.